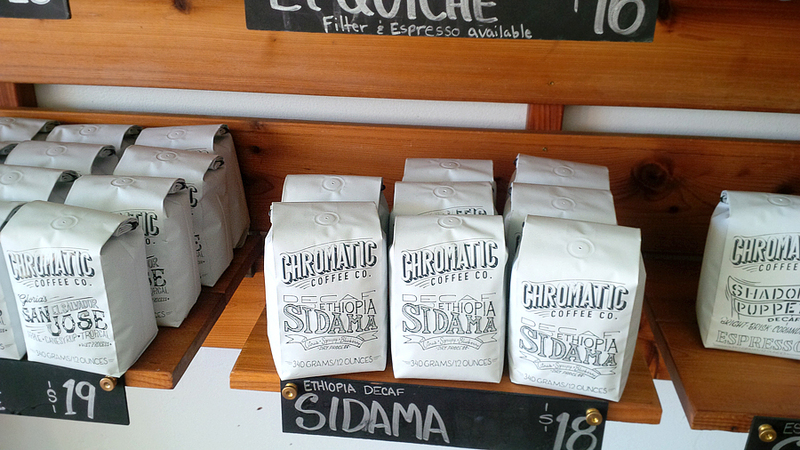 Exploring coffee shops: Chromatic Coffee Co. It never occurred to me to let you guys in on some of the coffee shops I visit. After I posted a photo of my first Starbucks red cup of the season, my old Graphic Design classmate Geri suggested I check out local coffee establishments rather than large chains like Starbucks. 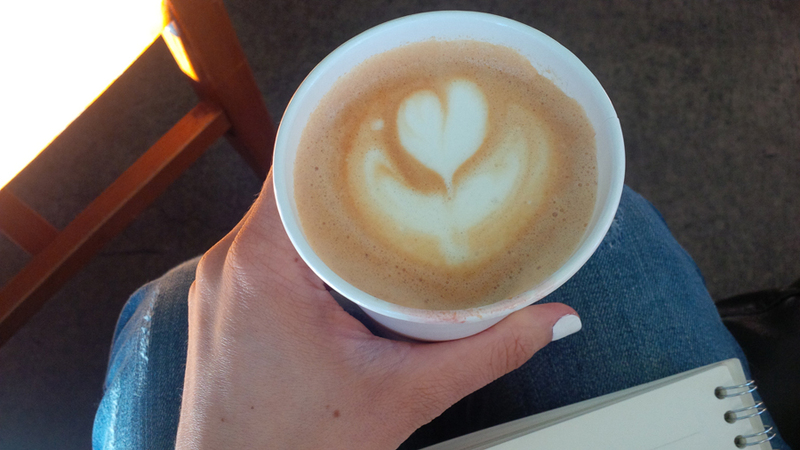 While I do often go to smaller one-off coffee shops, I didn’t really blog about it, except for that one time I went to Bellano! 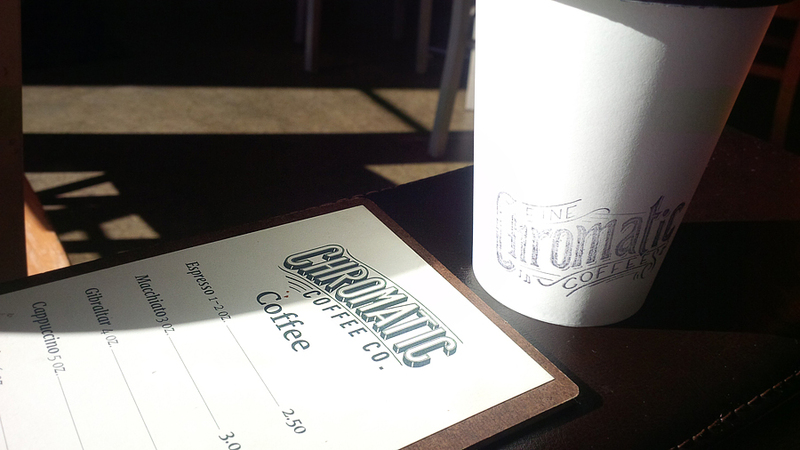 Today I’m bringing you along with me to Chromatic Coffee, a few blocks down the road from Bellano. For my own personal review purposes I’ve decided to order the same type of drink for each coffee shop I visit, a vanilla latte. I sound some fancy! It’s only because I’m not a fan of regular coffee — flavoured coffee’s is where it’s at you guys. That and iced vanilla coffees. Hoo-wee, yummo! This time I took my iPad, sat down and read for a little, people watched while I was at it too. It was pretty packed when I went this day since I popped in around lunch time. They were playing No Doubt (an ol’ classic fav of mine, brings me back to the early 2000’s when my local climbing gym back home played that). I got lucky and snagged an awesome comfy leather couch to perch myself down on and sip away. 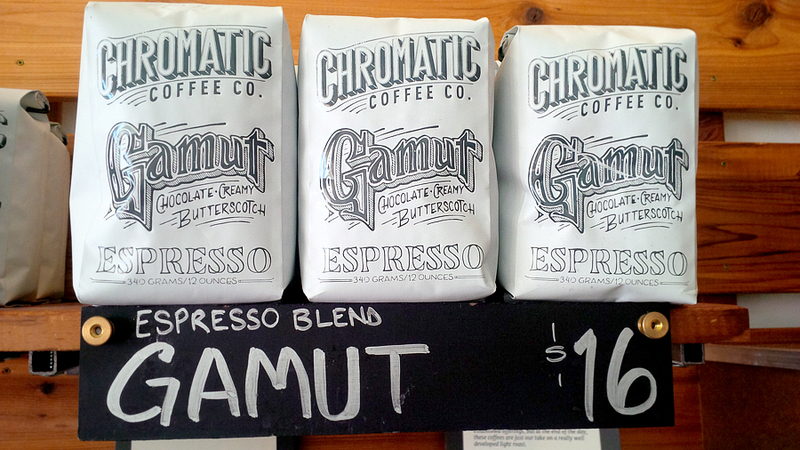 I love whoever did the Graphic Design for this coffee shop, and the fonts they used on the ground coffee packages. 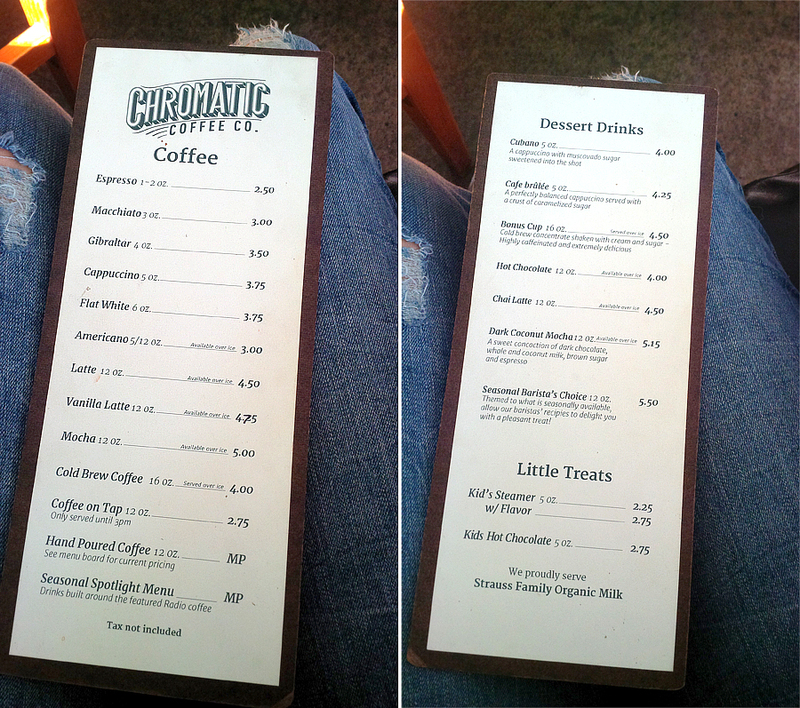 Chromatic doesn’t have a menu up on the wall, but they have a stand alone right in front of the cash register which is clipboard cut in half and smoothed out. Pretty snazzy if you ask me. It’s not the cheapest coffee spot I went to, I ended up paying $5.15 for my vanilla latte. Ouch. I love watching the barista’s work their magic. One dude was so quick with his hands pouring out two tea pots into two to-go cups at once, a little fascinating to watch especially since I’m a little clumsy. It’s like having “me time” and being social without being social. Know what I mean? I can write a lot of my blog posts here if I didn’t get annoyed and frustrated with my ipad no working with wordpress. Instead, I bring a pen and notebook, sit down for a bit and write a few pages. I stuck around for about an hour until my friend from Canada texted me, and I drove over to her house in Sunnyvale to hang out for the afternoon. What is your go-to drink when you’re at a coffee shop? 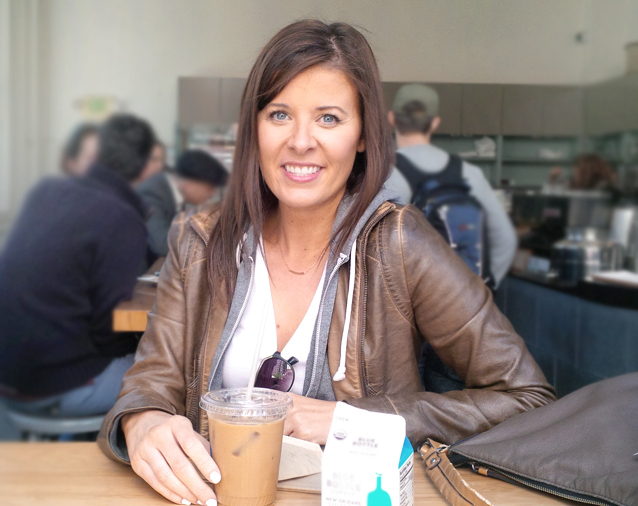 @Ashley @ A Lady Goes West: Oh the smell, it gets me every time – I love it too. 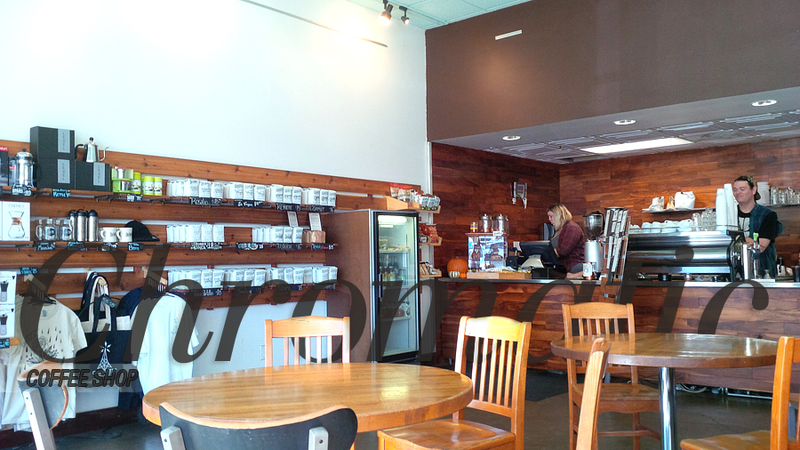 I can’t wait to go exploring the new-to-me coffee shops more in the new year :) Stay tuned hah! 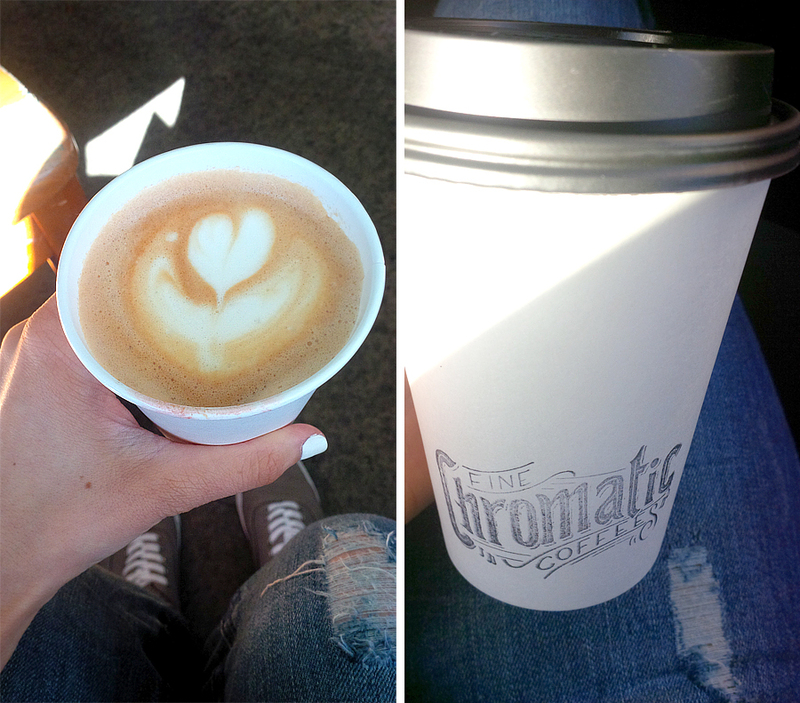 Nancy recently posted..Exploring coffee shops: Chromatic Coffee Co. I would just go in there to stare at the beautiful packaging!! Even though Starbucks is super convenient becuase it’s literally everywhere, I love little pop-up coffee places better! How fun! And I totally agree about the graphic design–it’s awesome! I love trying out new coffee shops! This looks like one I’d love. @Heather: It’s kinda hipstery, right? I love it. I’m a huge fan of supporting local businesses over big corporations, so yay for the little coffee shop around the corner! :) I just moved to a tiny little town where there’s not a coffee shop of ANY kind for almost 30 minutes, so I envy cute places like this! 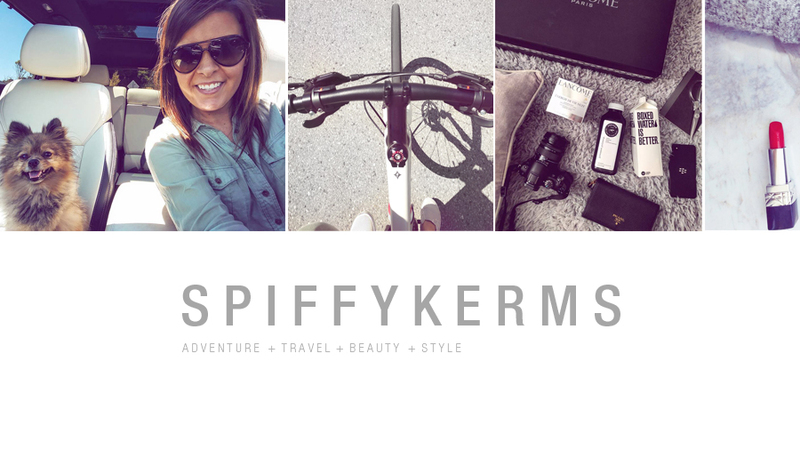 @Cara of Stylish+Geek Blog: Ooh I will have to check out the ones you mentioned, too. There are tons of coffee shops on my college campus and I love spending time in them! That coffee shop looks really cute: I love all the fonts on their packages and cups. What a great coffee shop. I usually just grab something from Starbucks. What a cool shop! I absolutely love finding new coffee shops! I still haven’t found my perfect coffee shop. sadness! I love a good local coffee shop! This one looks amazing. What a fun place! My boyfriend + I love exploring new coffee shops and make a point of visiting a new one every time we travel. Thanks so much for sharing, I’m sure I’d have a field day there. We don’t have any coffee shops around here and the nearest Starbucks is an hour and a half away and I only go there when I have to see my back tomorrow (tomorrow). Before my apt. I always grab something to take with me while I wait. At Christmas that’s usually a gingerbread latte. Back doctor that is, lol. I got distracted. I agree with you about whoever designed those bags! They’re super cute, but really “clean” looking too. I am not a big coffee drinker myself, but there is one place a few miles away that I can’t resist going to because it smells like heaven is pouring out of there, but my favorite drink is this weird espresso/frappe combo the coffee is strong and bitter, but the topping melts into it to sweeten it up omg it is sooo good, and the frozen hot chocolates! Ahhhh. I want coffee now! @Kimberly: How can you not be a coffee drinker but love the strong/bitter taste of an espresso? That’s definitely why I can’t drink coffee and prefer to stick to vanilla lattes or iced coffees haha! I love a good coffee shop! I’ve never really been a fan of coffee until recently. I love seeing all of the latta’s art that they make, some have very sweet designs. I love how clam and peaceful this coffee shop looks. How simple the menu is really nice as well. The story of my life is coffee shops and craft beer! I love exploring new places like this one. I would have ordered that 12 ounce mocha coffee! YUMMY! @Krystal: Ooh maybe I will get that next time, it sounds good! By the looks of your cool photos this looks like a great coffee shop. I just posted about how I am not a real coffee person but I do enjoy it from time to time. I really love coffee shops vibe and when I find a good one I want to stay for hours and make myself at home! I have to admit I never go to coffee shops as I hate coffee but I like the idea of coffee culture if you get me – going to a coffee shop to meet with friends, do some blogging or reading. I like the graphic design for that shop too, the fonts look great. It looks like a warm, homely place to grab a coffee. 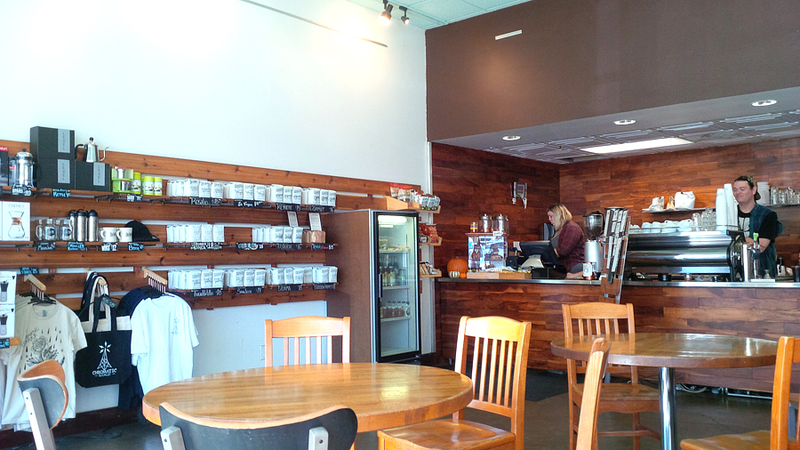 I love coffee shops like this and there are so many great ones in San Francisco. 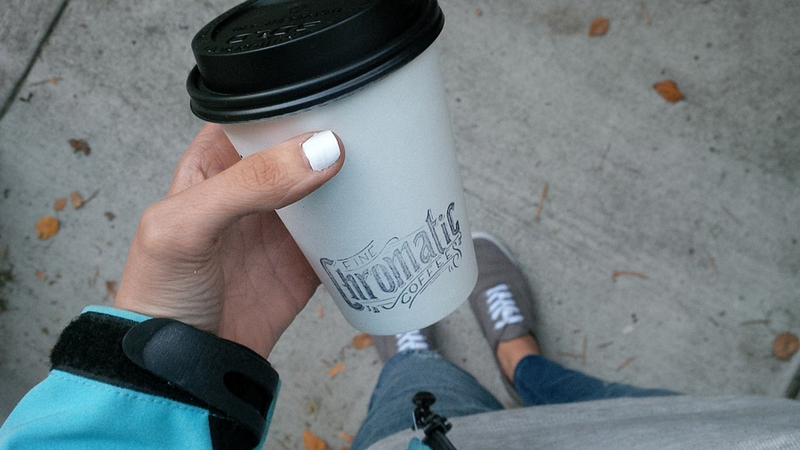 One of my favs is Coffee Cultures in the Financial District and there coffee cups are so similar to Chromatic! Nothing makes a community like a good coffee shop! How fun! I love finding little coffee shops like these. They’re always more peaceful to work at in comparison to Starbucks or super busy places like that. I might be in the minority here, but I don’t drink coffee, and worse, the smell of coffee makes me a little sick. But, with that said, I do think coffee shops are adorable, cute and so wish that I didn’t have an aversion to its main product. Great idea for for a journey though. This place looks dreamy! I love venturing into coffee shops! I love the coziness of coffee shops. Most places want people to get in and get out so more customers can come in, but coffee shops are designed for people to hang around and work, people watch or be social. It’s nice. This place looks like it would be a good place to spend a few hours. I’m gonna be in town next week and I’m gonna have to try that place out. Nice! Great pics too! This shop looks so cute! I’m not that big on drinking coffee but it’s fun to go out for a coffee date every now and again. I usually order a latte. Or the mint mojito from Philz if there is one around!! So good.